Bay of Islands is a tender port, so we were a bit worried that either the wind might pick up or the sea become rough, which would mean not stopping there. Luckily, we need not have been concerned, as we awoke to a nice fine day and it was not long before we dropped anchor and the ship’s tender boat transferred us to Waitangi Wharf. 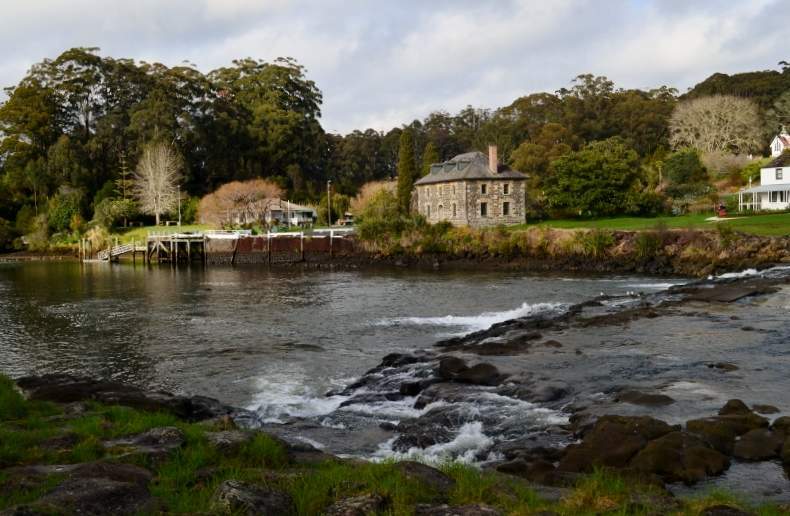 Our half-day tour began by taking us on a 45 minute drive to the oldest stone building, the Stone Store and Kemp House, New Zealand’s oldest surviving house built of kauri. On the way we saw the grounds where the Waitangi Treaty was signed. Next stop was Puketi Forest for a guided walk on a boardwalk to marvel at the massive kauri trees. When the old trees fall, we were told that this timber does not decay and one particular tree that had fallen in the forest provided enough timber for 10 houses. It was a wonderful experience to get up close and personal with these massive trees that are over 1200 years old. Our next destination was to the town of Kawakawa where we had some free time to sample the driver’s recommendation of doughnuts and cream (no hole in these doughnuts) which were excellent. It was only a short stroll from the bakery to what the town is best known for – believe me, we were very surprised to find that toilets could be a tourist attraction. Nevertheless we did find out some interesting information about this little town. 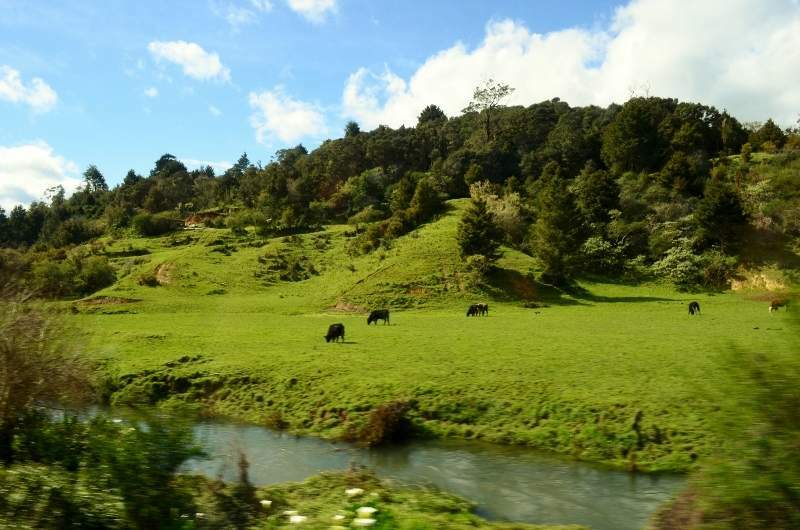 Kawakawa’s most productive years were in the 1800′s as a coal-mining town and for most of the twentieth century it had large meat and dairy processing plants, providing many jobs. However in recent years with industry restructure, many people lost their jobs but with the creation of the Hundertwasser Park Trust, this town is now getting a new lease of life…. all due to the public toilets!!! Friedensreich Hundertwasser (1928-2000) was born in Austria, and became New Zealand’s adopted son; internationally regarded architect and ecologist. He lived near Kawakawa for 25 years and was commissioned to design and build the public toilets in the town’s main street. He used local labour and talent, bricks from local buildings and the windows were constructed using old bottles from the district. The result is quite eye-catching with the light shining through the glass, internal mosaic walls and garden on the roof. Last but not least was our final destination, the Kawiti Glow-worm Caves. 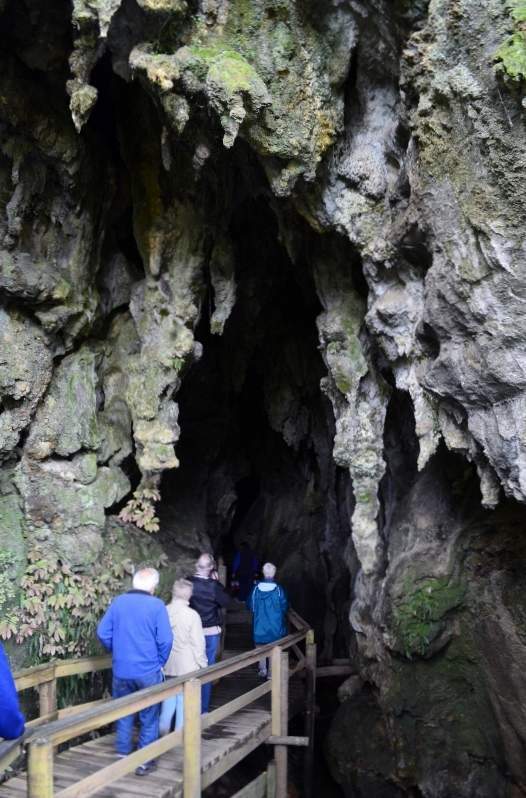 We were taken on a guided walk on a boardwalk through the caves where we saw a galaxy of glow-worm lights, impressive limestone walls and magnificent delicate stalactites and stalagmites. When the lamps went out it was magic to see all the little lights above our heads as we stood in total darkness; the only sound to be heard was the stream rushing over the rocks beneath our feet and the feel of an occasional drip of icy water on my face as I looked up! Of course we could not take photos of the glow-worms, but it will be yet another lovely memory from our trip. 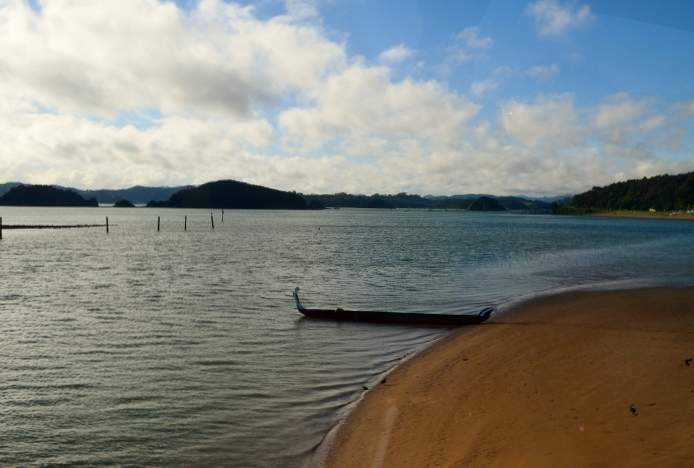 We are so glad we had the opportunity to visit the Bay of Islands, such beautiful scenery of the coastline and the mountains and thickly forested areas vying with emerald green fields dotted with dairy cattle and sheep. Sadly, this was our final destination and we have reluctantly started to pack – next stop in two days time: Sydney. But this is not the end – watch this space!